Conical (white) nozzles produce a focused spray pattern for more precise application. These are provided in most spray foam kits. Fan (yellow) nozzles produce a wider spray pattern for more coverage. These are also provided in most spray foam kits. 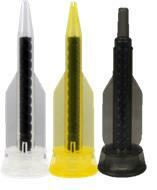 Injection (black) nozzles are used exclusively with Slow Rise formulas. Additional foam kit hoses and gun applicators are available in a variety of lengths and come with a standard Accessory Pack.